Dishwashers are great but, as with other kitchen appliances, they can be wide, while your kitchen may be small. Help is at hand though as manufacturers have realised that not all of us live in palatial mansions and so created the slimline dishwasher. And if space is at a premium in your home and you crave help with the dishes, any one of the five compact and slimline dishwashers here will fit the bill. A slimline dishwasher will not necessarily be less capable than a full-size best dishwasher but you do need to shop wisely, and it's fair to say a lot of the really cheap slimline and compact dishwashers are… less than amazing, let's say. Our current pick of the crop is the mighty Miele G 4722 SC, but there are five other suitable candidates on our list that will suit a variety of budgets. Slimline dishwasher benefits are obvious, as new models are energy efficient and frugal on water usage. Their miserly operating costs also make them a good bet if, say, you live on your own and don’t stockpile mountains of dirty plates at mealtimes. They’re generally of a 45cm width as opposed to the larger 60cm full-size models – they’re brilliant at tackling washing-up chores. Key features to look out for are place settings, or capacity in other words and what sort of programs are on offer. You can even make use of half-load settings too in order to squeeze even more value from your slimline dishwashing recruit. Though lookout for a least an A+ efficiency rating ideally. The first thing to be aware of is that the best slimline dishwashers are just as expensive as full-sized ones: it’s the tech that costs the money, not the capacity. But while they’re basic, they’re still better than washing dishes and they can be particularly handy in galley kitchens and the comedy kitchens landlords sometimes inflict on their tenants. You’re buying to fit a space here, so the first thing to consider is whether it’s a freestanding appliance to stick in a cutout or corner or if it’s to be integrated into the rest of the kitchen. Integrated devices expect you to stick a cupboard door on them and to have a board in front of them: if your kitchen units are raised on legs without baseboards then a freestanding model may look better. With slimline dishwashers, it’s important to ensure that you can actually wash your stuff. Adjustable top baskets are essential if you want to wash wine glasses as well as plates, or to move cups out of the way so you can wash bigger things in the main section. The more flexibility the shelves have, the happier you’re likely to be. Pay attention to the noise level if you’re in an open-plan kitchen/lounge. A few decibels (dB) here or there might not seem much on paper but there’s actually a massive difference between an almost silent 41dB and a wash that’s closer to the 50dB mark. Being a semi-integrated model, the Miele G 4722 SC sits nicely behind a cabinet door, matching the theme of your kitchen units. However, you’ll still be able to see the controls and this compact dishwasher packs in a lot of them via a panel on the top. The good news is that they’re all easy to figure out, with 6 programmes including Eco, Automatic, Intensive 75°C, Normal 55°C as well as Gentle and Quick PowerWash options. The machine can also determine how dirty your dishes are and aids drying duties by popping open the door at the end of a wash.
You can save more than two litres of water if you plump for the Eco mode, so it’s economical to run, while the overall performance of both washing and drying tasks is spot-on despite its slightly noisy operation. Inside, there’s a really good selection of racks for dishes and your cutlery is similarly well taken care of in the top drawer. You might find you get occasional watermarks on your cutlery in this area of the machine, but you could always remove the shelf entirely and rock it old school with a basket in the bottom shelf if this becomes a problem for you. It’s still an absolutely stunning slimline dishwasher. Slimline dishwashers can be tedious to load due to their diminutive stature, and the basic design of the Beko DIS16R10 means it’s no different. However, once you’ve wrangled its racks to suit your load it’s a treat to use. What’s more, there are also 10 place settings so there’s room for everything. Granted, the little Beko doesn’t come armed to the teeth with programmes so it’s light on ‘wow’ moments, but it still covers all bases. Choose from an eco 50°C wash, a rigorous 70°C wash and the rapid-fire option Quick & Shine to name but three, which incidentally clocks in at less than an hour. There’s a super-swift 30-minute wash at 35°C too and top marks go to the drying ability of this budget compact dishwasher, with hardly a hint of streakiness in sight. Sadly, there’s no half-load option though. The Fast+ option is another good one if you’re looking for your dishes pronto as you can speed up any one of the programmes to achieve express lane washing up. We also like the way you can be up and running in minutes too thanks to the basic but hugely effective touch-sensitive controls for the program settings. Compromise comes with a lack of a child lock and you could quibble with the excellent but not optimum A++ energy efficiency rating. Nevertheless, the Beko DIS16R10 is the best slimline dishwasher budget buy out there right now. The Bosch SPV66TX01E is instantly appealing thanks to its 10 place setting options, which means it’s very capable for a slimline model. There are 7 programs, which let you to cover all cleaning bases while the machine itself gets looked after too thanks to a service wash option. Handy. Auto mode lets the machine make all the decisions, but the eco 50°C is probably one of the reasons why this model gets an A+++ accolade. However, this appliance is also smart as it’ll let you tweak programme settings, so if you’ve got really greasy plates for example, there’s the option for whacking up the temperature. Other standouts include the varioDrawer, which lets you find a home for everything and anything on the crockery front. The intelligent PerfectDry is a highlight too, with the Bosch SPV66TX01E able to produce pleasing streak–free cutlery time after time. There’s fun stuff here as well, with a light inside the dishwasher for easy load and unload duties plus the remaining program time gets projected onto the floor for good measure. A nice touch. This baby should also be dubbed ‘the silent cleaner’ as it’s so good at dishwashing without making a fuss. Add on that suite of cool features and you’ve got a winning formula. Siemens has done a great job with the SR256I00TE. It’s nicely designed and very well put together, but it’s the cleaning potential here that’s the winning ticket. The double spray arms seem able to tackle anything, while it’s also a top choice when it comes to drying your dishes. There are ten place settings and the auto programme is able to detect the level of crud on your dishes and tailor a setting to suit, or you can pick from intensive, eco and silent options too. There’s even a lower temperature mode for delicate glassware. We love the way you can set it to start when you want, day or night, plus there’s reassuring anti-flood technology built-in and a child lock makes it a family-friendly choice. The Siemens SR256I00TE is also super efficient, with an A++ rating that means it’s cheap to run, especially if you plump for its stingy eco program. Sorry, but you’ll need to read the manual though as this is not one of the easiest compact dishwashers to master… but it does reward you with super clean dishes. The AEG FSB51400Z is a fully-integrated slimline dishwasher that comes with 9 place settings, which makes it more than suitable for a couple or small family. It’s got AutoSense too, which uses a sensor to work out how many dishes need to be washed and what sort of state they’re in. The fast wash setting is handy for lightly soiled dishes. Despite the fact the AEG FSB51400Z only has an A+ energy efficiency the machine is reasonably intuitive and can still ensure you’re using less water and not running programmes unnecessarily. We also like the upper basket, which offers a safe haven for your more delicate glassware items. AEG has also integrated its AirDry technology, which basically pops open the door during the drying cycle and for that it gets a high mark for drying efficiency. We also like the way that progress during the washing cycle is projected onto the floor, with a green light indicating when it has completed. That grey finish looks pretty stylish too. The only downside is that the AEG FSB51400Z doesn’t come with a child lock. Oh, and while it only has an A+ energy efficiency rating those two negative points are more than outweighed by the substantial positives on offer from this compact appliance. 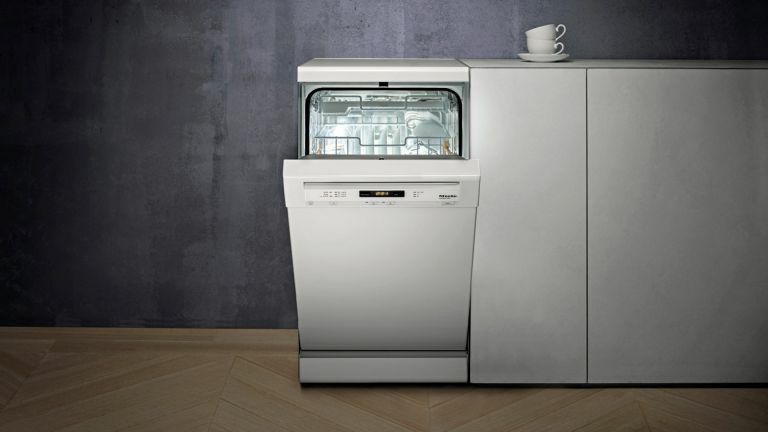 Bosch has long made the tabletop dishwasher of choice for Western Europe, and this Serie 4 incarnation maintains that. It comes with enough space to accommodate six average-sized dinner plates, a few side plates, a quartet of mugs, a carving knife or two and a clutch of cutlery. Like most mid-priced dishwashers, it also comes equipped with a sensor that measures the level of contents within and adjusts water consumption accordingly. And because it’s pretty quiet, it shouldn’t disturb the peace if you live in a studio or open-plan. The Serie 4 features five washing cycles from 40 to 70 degrees C, and does a stand up job, whilst squatting on your worktop. A good thing, in a small package.